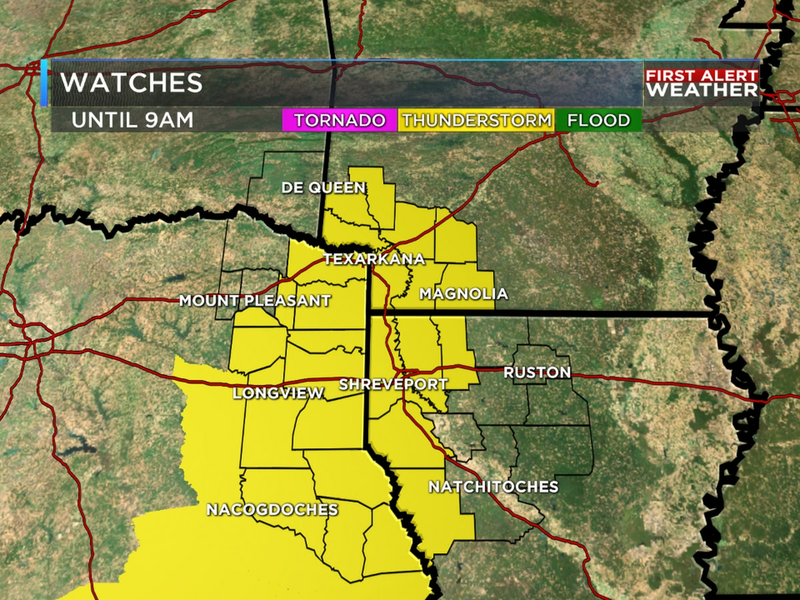 A Severe Thunderstorm Watch is in effect for most of the ArkLaTex until 9am. The threat of strong to severe storms will start to increase overnight. Scattered storms are expected mainly north of I-20. A large line of strong storms is expected to move from west to east across the area overnight into Thursday morning. The main threat will likely be strong to damaging wind gusts. The tornado threat is low, but not zero. The strongest storms that develop this evening and within the line of storms tonight could also produce hail. Localized heavy rain and flooding will be possible as well. Most of NW LA and portions of E TX and SW AR will be under a FLASH FLOOD WATCH from 7 p.m. Wednesday to 7 a.m. Thursday. Locally heavy rainfall of 2-3″ of rain will be possible within the watch area. Most of the area has seen a lot of rain recently, and additional heavy rainfall over a short period of time could flooding problems. 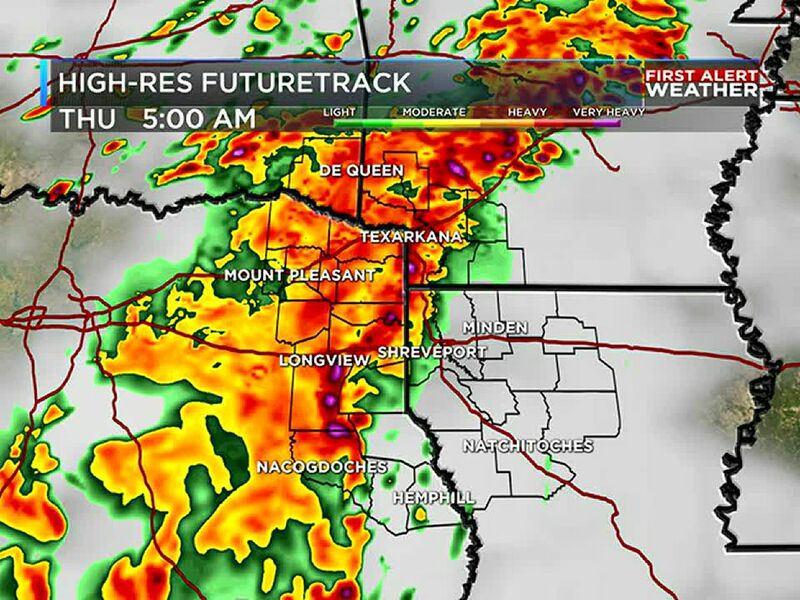 Rain and thunderstorms could impact your morning commute on Thursday, especially across portions of NW LA. 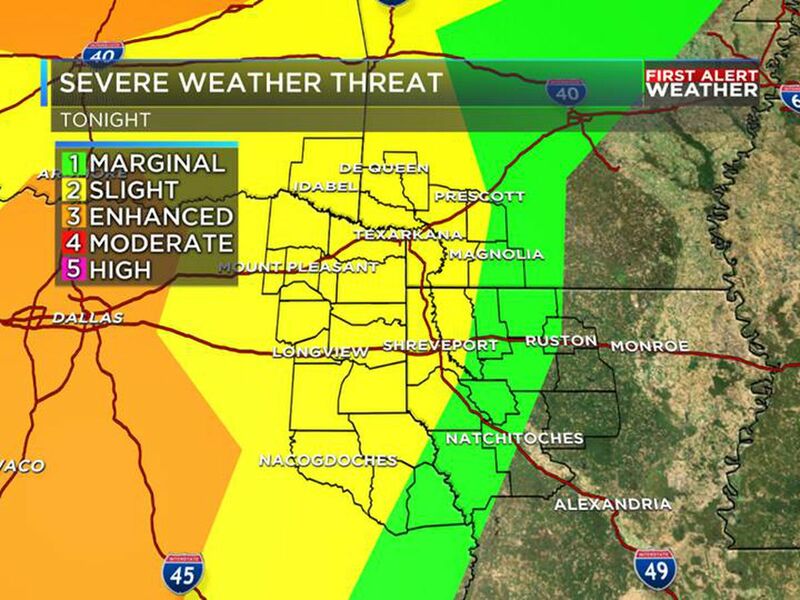 The threat of severe weather will come to end for most of the area Thursday morning. Scattered showers will continue into Thursday afternoon. The threat of strong to severe storms could linger into late Thursday morning or early Thursday afternoon across the southeastern corner of the ArkLaTex. However, the threat of severe weather will shift east of the area by late Thursday afternoon. Highs on Thursday will range from the upper 60s north of I-30 to the low 70s south of I-20. Thursday will also be breezy with a northwest wind at 10-20 mph. The clouds will out Thursday night. Lows will be in the upper 40s to near 50 degrees. Friday will be a sunny, cool day. 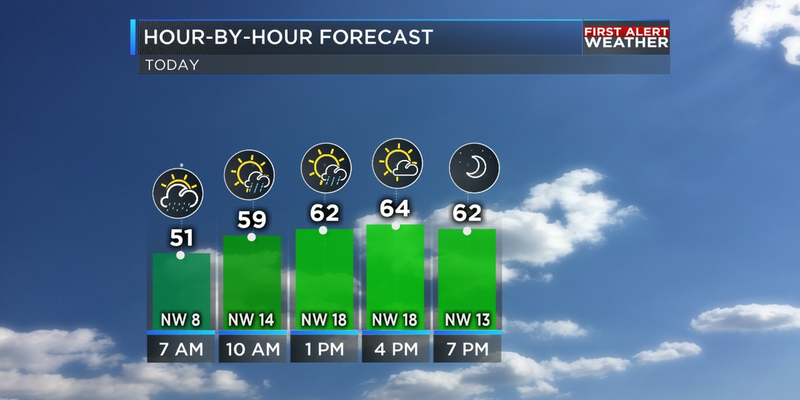 Highs will only be in the mid to upper 60s. Friday will be breezy with a northwest wind at 10-20 mph. Temperatures will start to rebound this weekend. Highs on Saturday will be in the upper 70s and near 80 degrees on Easter Sunday. Both days will feature a ton of sunshine. The start of next week will be warm. Highs Monday through Wednesday will be in the upper 70s to near 80 degrees. Scattered showers and storms will be possible at times, too. With the threat of severe weather coming overnight, make sure you have a way to get weather alerts. Your alerts should be able to wake you up if a SEVERE THUNDERSTORM or TORNADO WARNING is issued for your area. Showers wrap up Friday. Sunshine and dry weather return for the weekend.